Red Shoes draws from the rich imagery provided by fairytales, both grim and glorious. The dancers enter a forest of poles, a place beyond the ‘normal’, where strange things might occur, and strange people might live – the home of magic, imagination and ultimately transformation. 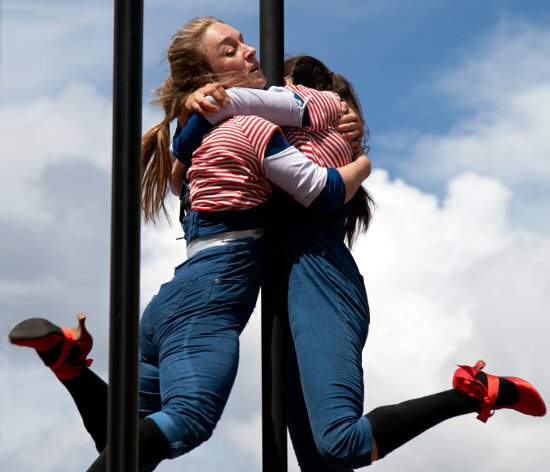 The work explores themes of loss, journey, transformation, and uses dance, Chinese poles and other circus techniques to create a new playful outdoor dance work. The Red Shoes set is a steel deck construction with Chinese (scaffold) poles protruding vertically. Total footprint is 7320mm x 3660mm. Maximum height is 5750mm. Upswing require the promoter to provide an absolutely flat, solid base on which to construct their set (grass will not do unless it is surfaced with a shutterboard or ply). If this floor is not perfectly flat then the promoter should supply suitable packing for Upswings steeldeck structure. It is important to note that Upswing cannot perform this piece in wet weather!